The following is a partial list and description of the many hardware products, supplies, tools and other related items and services provided at Triangle Hardware. If you have any questions or need a special item ordered, don’t hesitate to call us at 863-385-2516. We provide knowledgeable service and will help you in any way we can. Triangle Hardware stocks all styles and sizes of A/C Air Filters. We can also custom order any size you need. We are an authorized dealer for top rated Precisionaire Air Filters. Bring us your old key, and we’ll make you a new duplicate key in a matter of minutes. We also sell all types of key chains, key rings and accessories. And much more. We’ve to the right tool for the job. We sell Oxygen and Acetylene for cutting. And we sell mixed gas for welding. In addition, we sell Helium. 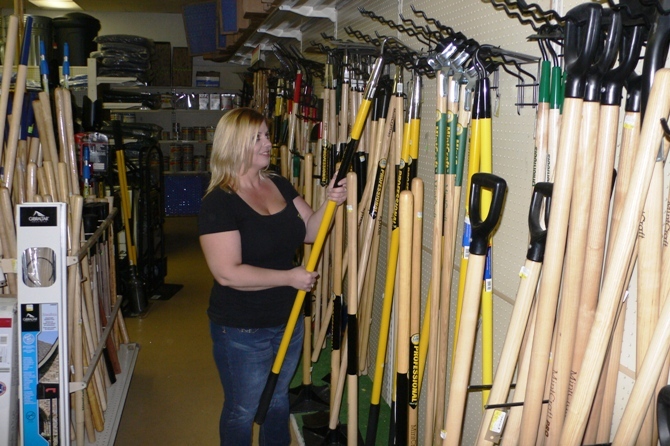 • Lawn and Garden Tools – everything from Hand Spades to 8 Foot Posthole Diggers, Axes, Rakes, Shovels, Pump Up Sprayers and much more. At Triangle Hardware, we’re one of the last places in America where you can come in and buy the exact quantity of nails you need by weighing them. Whether you need a quarter pound of nails, a pound or more, you can pour the number of nails you need in a bag, weigh them and check out. We save customers money by maintaining this long time tradition of allowing our customers to buy the exact quantities they need. And more. At Triangle Hardware, we sell individual nuts, bolts, screws and fasteners – which means you don’t have to buy an entire pack. You can buy the exact number of nuts and bolts you need, just one if you want. Other places make you buy pre-packaged items, which means you end up wasting money and buying more than you need. 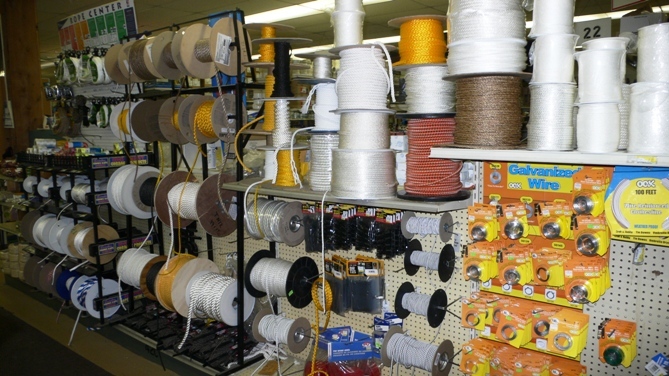 We also sell Bungee Cord by the foot. Triangle Hardware sells a wide range of steel for all types of commercial uses and construction needs. 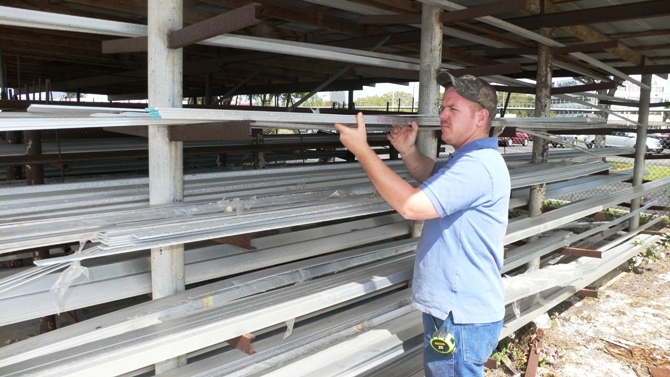 This includes steel used to build trailers, gas lines, galvanized water lines, stair railings and more. We also cut and thread pipe up to 4 inches. We also sell all essential sprinkler heads and fittings. In addition, we stock the Poly pipes and PVC pipes. Remember, if you don’t see the exact item you’re looking for on our shelves, we can special order and get whatever you need quickly. Don’t hesitate to ask. Cam Lock Fittings – for fuel transfer, septic trucks, quick connects for pumps, aluminum and polypropylene, up to 4 inches. We can order larger sizes. Cleaning Supplies – dozens of top names for all types of cleaning needs. Everything from dish soap to specialized cleaners, driveway cleaners. Culvert – metal pipes for drainage, 15 inch, 18 inch and 24 inch. We can order other sizes. Locks – a large selection of sizes and styles for different uses. 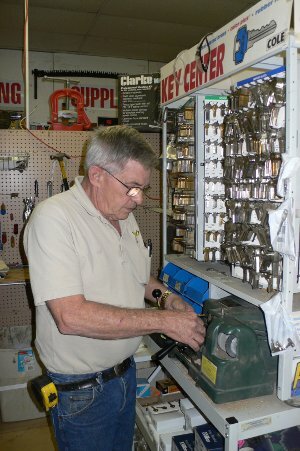 We sell Master Lock®. 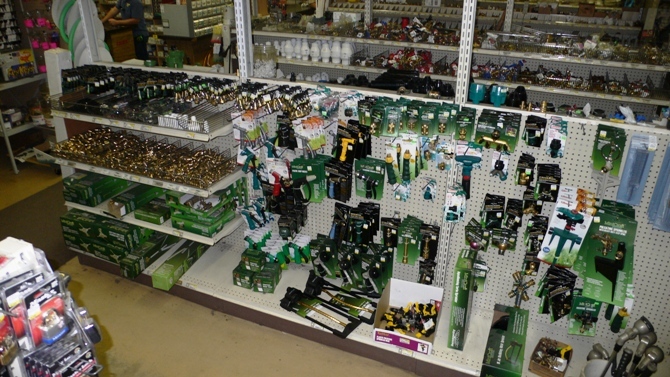 Power Tools and Accessories – we carry a select inventory of power tools including saws and drills. We also sell all types of Saw Blades, Jigsaw Blades, Masonry Blades, Steel Cut Off Blades and more. 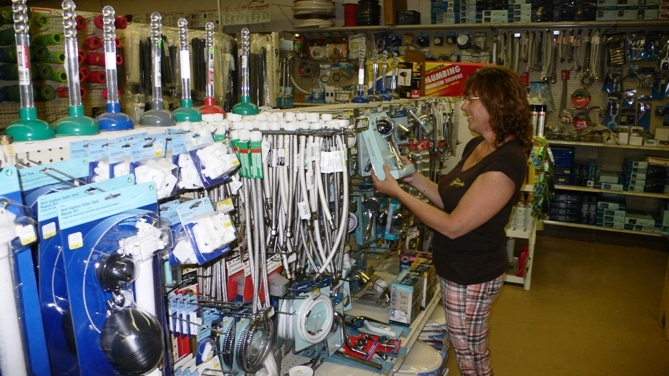 Pumps – Goulds Pumps for house pump and irrigation pump needs. Rust-Oleum Paint – spray, quarts and gallons. We also sell BLP Mobile Paints, a commercial grade rust inhibitor paint. Sealants, Lubricants and Adhesives – We stock many top name brands.